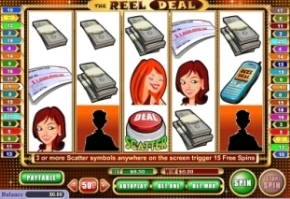 The Reel Deal slot game is based on the popular hit tv show and offers 2 exciting bonus rounds. The top prize is $100,000! When 3, 4 or 5 Red Button scatter symbols stop on any of the reels a 15 free spin bonus round is triggered and each payline win during the free spins is doubled. In addition, the scatter win can be 10, 100 or 1000 times your wager depending on the number of scatter symbols that stopped on the reels. The free spin bonus can be retriggered but any additional free spin wins are paid at regular payline prize awards. The feature bonus round is the briefcase bonus and is triggered when 3 briefcase bonus symbols stop anywhere on active paylines. In the briefcase bonus you're presented with models holding 26 briefcases. Each briefcase contains a hidden cash prize. The 26 possible cash prizes are displayed on both sides of the models. In the first round you select the briefcase that you think contains the highest cash prize. After that you pick 6 more briefcases. The models open your selections revealing a cash prize and the corresponding prize is removed from the board. The banker will make you a cash offer which you can accept or decline. If you accept the offer the bonus round ends. If you decline it you open 5 of the remaining 20 briefcases and the banker will make you another cash offer. If you decide not to accept this offer you then open 4 of the remaining 15 briefcases. You can keep refusing offers until there are just 2 briefcases left, the last remaining briefcase and your original selection. Best Features: Free spins and scatter wins can pay pretty good. The game has stop button like land casino slots.